Editorial: Responsibility - We cannot make any progress without taking responsibility for ourselves, says Jacob Ninan. An open letter to the Intellectual Christians - No one has ignored God’s wisdom and direction without facing its just consequences, warns Hermon Khonglah. After death, what? 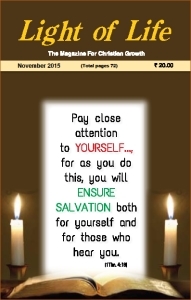 When we accept Jesus Christ as our Saviour and Lord, we are saved form eternal damnation, reminds K. V. Varghese Ampat. God makes evil work for good - Zac Poonen explains how God makes evil work for good. Jolee – Vela and Christian Ministry - Christian ministry cannot be dichotomised as secular and divine, points out Samuel George. One minute without you - Stay as close to Jesus every minute and as much as possible, exhorts Sharon Sugumaran. Sabbath and the christian faith - There is a present rest and an eternal rest for those who believe the Gospel, points out Vivek Salins. The 18 minute sermon - The realm of media has invaded the church and religion, cautions Shantanu Dutta. The three triggers - Let us trigger the God-given triple gift...to transform India exactly as the Lord Jesus desires to see it, encourages Esther Robinson.